Size: 35 x 50 cms. Title: 'Irelandiae Regnum' first printed in Duisberg 1587. Gerard Mercator's map of Ireland from the Mercator Hondius atlas with Latin text printed on the back. A fine, early map of Ireland with west at the top of the map. 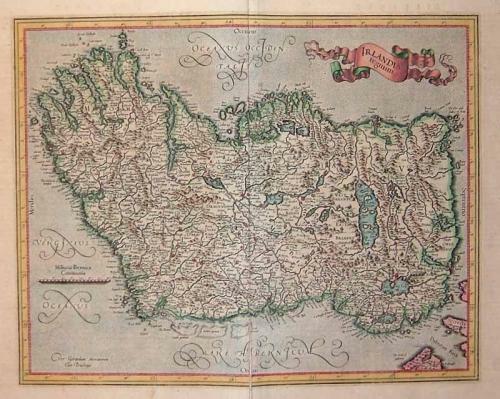 This is Mercator's first map of Ireland. The map is in excellent condition with wide margins and no discernible faults except for a lower centerfold repair to the verso that shows through to the image.